It’s staring at you. Looming over you like Mount Everest. That monumental task you know needs to get done, but that you’re completely unmotivated to tackle. You skirt around it. You try to ignore it. But it’s still there. Steadily bearing down on you, mocking you. You know the only way to get rid of its silent teasing is to look it square in the face and deal with it. But how do you do it when your motivation seems to be buried under an avalanche of “I don’t have the time,” “it can wait until later,” “I don’t know how,” “it’s too hard,” and “why me”? Well, you can either stay miserable or motivate yourself. It’s your choice. 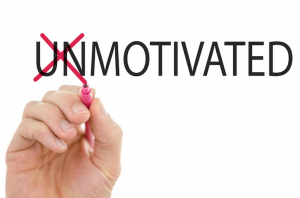 Here are ten great ways to find motivation when you feel completely unmotivated. Pessimism will drain your energy and motivation. Optimism, on the other hand, can energize and recharge you. If negativism is blocking your motivation, look for positive aspects in the situation. What good thing can you find? Is there a hidden opportunity? If negative people keep you stuck in one place, spend less time with them. Look for those that infuse you with enthusiasm and allow their positive energy flow to invigorate you. When something feels monumental and daunting, it often leads to procrastination. So, chip away at it, break it down. Every journey starts with a small step. Even taking tiny 1-2 minute steps tackling your project or task will get your forward momentum going. Keeping track of why you’re doing what you’re doing and where you are in your journey can rouse your motivation and keep it going. So, remind yourself why dealing with this matter is important. Put your reasons down in writing. Boost your motivation even more by looking back and noticing how far you’ve come already. Don’t compare your journey with that of others; compare yourself to yourself. Preparing yourself for a project in the midst of a mess will only cause your mind to be in shambles too. Take some time to declutter and clean your workspace. That includes getting rid of distractions. You may be surprised how clearly you can think when you’re surrounded by an organized and clean environment. Knowing when to adjust your to-do list is not a sign of weakness. An overly lofty goal or a crammed to-do list can look so unattainable that your motivation may go down the drain. So, adjust your goals for the day to stay within reach. The important part is to move forward and succeed in what you’re aiming for. In time, you may be able to set your aim higher and higher. The monotony of always approaching a task from the same angle can put motivation into a deep sleep. Instead, keep things fresh, mix it up. Vary your steps, compete with yourself, do things that you usually don’t do. Keep yourself on your toes and moving. Working non-stop can drain your energy quickly. So, don’t forget about taking breaks—10 minutes during each hour is a great way to refresh. What can you do during that time? Eat a snack, get some fresh air, stretch, meditate, focus on deep breathing, or play some upbeat music. Regular breaks will clear your mind and reduce tension. Your body in motion releases a lot of feel-good chemicals and inner tension. Regular exercise—such as taking a walk in nature, dancing, lifting free weights, or jumping on a trampoline—can boost energy and motivation. It doesn’t have to be a long drawn-out exercise routine. Just move your body, perhaps first thing in the morning before getting ready to tackle your tasks. Looking forward to a reward for reaching a goal or handling a matter at hand can be very motivating. No matter how big or small your successes are, celebrate them. Just make sure you’re rewarding yourself for truly reaching them, not just because you want to celebrate. And a reward doesn’t always have to be a tangible thing you get yourself, it can also just be the satisfaction of being able to tell someone about your success. Stumbling and failing is inevitable with any project. Sometimes, there are little hiccups, and other times, there are big mess-ups. Don’t beat yourself up about them. It will only make your motivation take a nosedive. No matter if they’re small or big, you can make setbacks less hurtful by being constructive and looking at their value. Always ask yourself what you can learn from them and use the lessons learned well for future endeavors. The sad truth is that motivation often doesn’t last a long time, nor does true motivation come from outside. But that just gives you more reasons to put effort into finding motivation within yourself each and every day. By using the above-mentioned techniques, you can learn to effectively tap into your inner strength and motivate even the unmotivated.